Mr Badger is the Special Events Manager at a splendid hotel. Ably assisted by Miss Pims the seventh birthday of Miss Sylvia Smothers-Curruthers is set up. When all is ready the guests arrive. Mr Badger does his best to ensure the party runs smoothly and everyone has a wonderful time. A task that isn’t so easy when the birthday girl is Sylvia. Mr Badger is very good at his job and even though everyone is happy at the end of the party, Mr Badger is a little sad. He is sad because he has a secret, that he couldn’t mention all day, but the day isn’t over yet. A charming story about steady Mr Badger and spoilt Sylvia. Not to worry though I think you will walk away feeling a fondness for Mr Badger and very little for nasty, spoilt Sylvia. 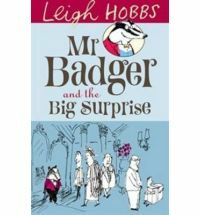 Accompanied by plenty of Leigh Hobb illustrations this is a wonderful and entertaining story for those wanting to start reading chapter books.